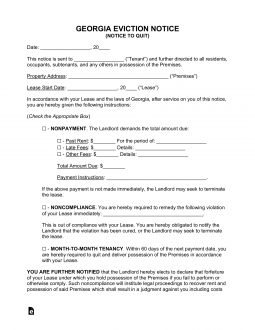 The Georgia eviction notice forms may be used to inform a tenant who is in breach of his or her lease or whose term is going to expire, that they need to vacate the premises owned by the landlord. The landlord must abide by the terms of the lease for the amount of notice given for breach of the agreement. If there is no provision, the landlord can ask the tenant to move immediately by providing a notice in writing. If the tenant fails to comply, the landlord may file a dispossessory action with the Magistrate Court in the county in which the property is located. The landlord will need to obtain an original Dispossessory Affidavit in order to begin the eviction process if the tenant does not respond to the Notice to Quit. Immediate Day Notice of Quit (Non-Payment) – Use this form to ask your tenant to leave after the tenant has breached the lease and you have followed the terms of the lease with regard to termination and notice requirements. 30 Day Month-to-Month Notice to Quit – Use this form to give your tenant notice that you do not intend to renew the lease at the end of the term. The Landlord is required to give at least sixty (60) days’ notice to the Tenant while the Tenant must give at least thirty (30) days’ notice to the Landlord. Non-Compliance – There is no Statute that requires the tenant to have prior notice when they are in violation of their rental contract. Therefore it is recommended that the landlord inform the tenant of their infraction and if they do not cure the lessor should begin the filing of an eviction. Rent is considered late if it is not received on the date it was due as specified in the terms of the lease. Step 1 : Make sure you have read your lease carefully and abide by the notice and termination terms set forth therein. You will then either provide the tenant with an Immediate Day Notice of Quit (Non-Payment) or a Month-to-Month Notice to Quit. Step 2 – If the tenant fails to respond to the notice, you are then entitled to file a dispossessory action in your Local Magistrate Court. The courts have the form you need to file – you must use the Dispossessory Affidavit. You will need to have your tenant’s name and address, the reason that you are seeking dispossession and you will need to certify that you provided notice to your tenant to vacate the premises. Step 3 – The dispossessory warrant will have to be served on the tenant usually by a sheriff or other approved State serving method. Step 4 – The tenant will have seven (7) days to respond with an Answer Form (tenant may use the Online Form Service to fill-in). If the tenant does not respond, the landlord may obtain a Writ of Possession from the court to take back possession of the premises. Again, you will need to obtain from your local court. Once the landlord has a Writ of Possession signed by the court, he or she can have the sheriff remove the tenant. You should have a copy of the Signed Lease or Lease Agreement available to consult when filling out this template. The information on the Lease that must appear on the Notice must be identical. This Notice is available as a PDF, ODT, or Word Document by clicking on the appropriate button then saving it to your computer. Enter the Name of the Tenant (or Subtenant) this Notice must be delivered to. This Name should be presented identically to the way it is reported on the Lease. In the first statement, provide a report on the City, County, and Zip Code where the Property is located using the first three blank spaces. Also, in this statement, you will need to provide the Building Number and Street for this Rental Property and the Rental Property’s Apartment Number (if applicable) on the last two blank spaces. In the next statement, enter the Calendar Day the Lease was Signed, the Month the Lease was Signed, and the Year the Lease was Signed using the three blank spaces provided. Select the checkbox that adequately describes the reason you are having this Notice delivered. The first checkbox is for Landlords issuing an ultimatum to a Tenant with a delinquent account. In this case the Tenant will be given be required to Pay the Past Due Amount or Quit the Premises immediately. The Identity of an Agent, additional to the undersigned, who may receive this Past Due Amount from the tenant. The Overdue Amount and the Time Period requiring a payment must also be defined. The second checkbox is provided for Landlords who must rectify a situation where the Tenant is not compliant with the terms of the Lease. This selection informs the Tenant that he or she must comply with the terms of the lease, rectify the violation, or turn over the premises to the Landlord immediately. The third checkbox should be marked if this is a Month to Month Tenancy where the Landlord is terminating the agreement. Of course, the Date the Month to Month must end will need to be documented here. The fourth check box is provided for Tenants who are informing their Landlord of their intention to terminate the Lease. This requires the Date of this Termination to be documented on the blank spaces provided. The Landlord or an Authorized Agent action on the Landlord’s behalf must Sign his or her Name on the blank line below the Disclosure Paragraph just above the last section. The Delivery of this Document must be documented and verified on this document by the Agent Effecting Delivery. This will require the Date of Delivery, the Identity of the Recipient, and an explanation as to how this Document was delivered. This last will be as defined by marking one of three checkboxes. The first checkbox indicates a Delivery to the intended recipient while the second checkbox indicates delivery to a second party who is of age and will reliably complete the delivery to the intended recipient. The third checkbox will indicate this paperwork had to be sent via First Class Mail. Below this, the Agent must Sign his or her Name on the blank line.